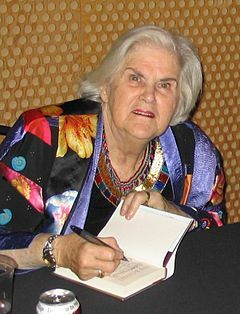 Very sad news, fantasy and sci-fi author Anne McCaffrey, the creator of Dragonriders of Pern, died on Tuesday the 21st November 2011. No exact news yet on how, but I suspect it was old age. Anne McCaffrey was born on the 1st April 1926. She published nearly 100 books, mainly fiction, the first in 1967. Born in the United States, she emigrated to Ireland in 1970, where she lived in a home of her own design, “Dragonhold–Underhill”. McCaffrey had had two short stories published during the 1950s. The first was written in 1952 while pregnant with Alec, Freedom of the Race about women impregnated by aliens. It was placed by Sam Moskowitz in Science-Fiction Plus. Up until 1990 McCaffrey co-authored more than 30 books: at least fifteen with Elizabeth Ann Scarborough; other fiction with Margaret Ball, Mercedes Lackey, Elizabeth Moon, Jody Lynn Nye, and S. M. Stirling; the non-fiction Diversity of Dragons with Richard Woods. During the last decade she and her middle child Todd McCaffrey collaborated to continue the history of Pern. As of June 2011, they had completed four Pern books jointly and Todd has authored three solo. Another collaborative sequel is expected in spring 2012. In 1968, McCaffrey became the first woman to win a Hugo Award for a work of fiction, and in 1969 became the first woman to win a Nebula Award. She became the first with a science fiction title on The New York Times Best Seller list in 1978, with The White Dragon. The Science Fiction Writers of America in 2005 named her the 22nd Grand Master, a now-annual award to living writers of fantasy and science fiction. The Science Fiction Hall of Fame inducted her 17 June 2006. « Lost in Yoda translation?